This decorated flower pot is very impressive. It is a wonderful gift for Mom or any plant lover. I have given them away as teacher's gifts too! 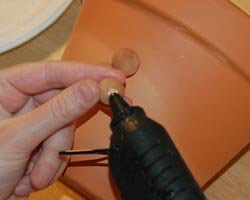 It is made from a simple Terracotta pot and air hardening clay. You do not need to have any prior experience working with clay to make this craft. All the step by step directions are below. 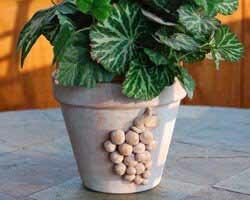 Get creative and think of some other designs to put on your flower pot! If you would like to find a use for the rest of the clay you did not use, be sure to check out the football coin holder project on the Father's Day page. 1. Begin your decorated flower pot by washing and drying the Terra cotta pot completely. Open up the package of air hardening clay. Follow the manufacturer's instructions on how to work with it and store it. Usually it is very soft right out of the package, ready to mold. 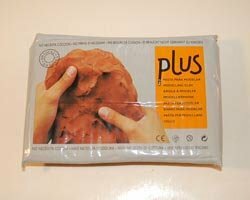 Store unused clay tightly wrapped in plastic wrap and in an air-tight container. 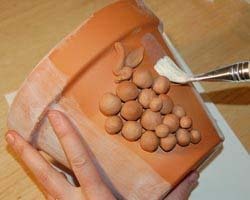 Begin to roll little balls of clay between your hands, to make the grapes. Make some large, some small. 2. Begin to assemble the bunch of grapes. 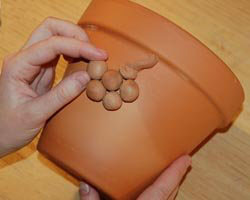 Make the stem by rolling a small cylinder of clay, and then bending it. Make a leaf by rolling a ball, then pinching it at each end to make a football shape, then flatten slightly. Set up your work to dry on a piece of card stock. 3. Allow to dry completely. Follow the manufacturer's instructions. 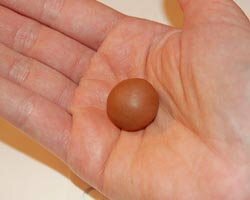 It usually takes a full day for the clay balls to harden. 4. Take one grape at a time, and apply a strong glue, such as E6000, to each one. 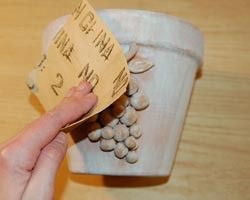 The photos show using a hot glue gun, but hot glue isn't as strong and the grapes may pop off over time. E6000 glue works really well. 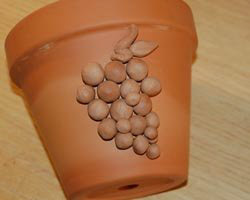 Then adhere the grape to the side of the flower pot. 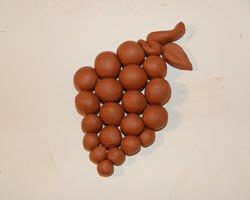 Try to maintain the design, working from the middle of the bunch of grapes, out. 5. 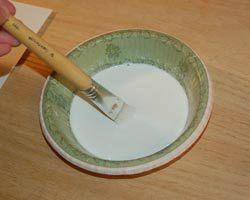 Mix 1 part white acrylic paint to 8 parts water, in a disposable bowl. 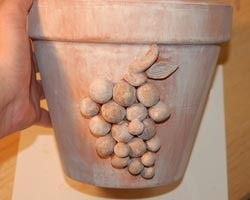 Apply this whitewash with a large paint brush to the entire pot, including the grape design. Allow to dry. 6. Sand the grape design lightly with the sand paper to lightly buff off some of the whitewash from the grape design for a worn effect. The decorated flower pot is now ready to use.